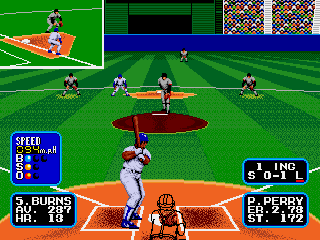 As a launch title on the Sega Genesis, Tommy Lasorda Baseball has the distinction of being the first sports game on a system known for its sports games. It was also the first example of Sega paying big bucks for a celebrity endorsement, as they later did with Pat Riley Basketball, Joe Montana Football, and Michael Jackson’s Moonwalker. Sega must have spent their entire marketing budget on Coach Lasorda though, because the game lacks both an MLB and MLBPA license. It’s not a big deal though, as the game features teams from every city that had an MLB team at that point, and they coincidentally use the same uniform colors. For game play options, you can choose between a single game in either 1 or 2-player mode, or a 30-game season complete with a password-based game save system. One of the best things about this game is probably something that most people wouldn’t even consciously notice. In most of these older baseball games, fielding is a huge issue because you often don’t know which fielder you have control of when the ball is hit. Ball going straight towards the second base bag? Maybe you’re controlling the second baseman, or maybe it’s the shortstop. Tommy Lasorda Baseball solves that problem by verbally telling you, in crystal clear digitized speech, which fielder you’re controlling. The graphics are perfectly fine for an early launch game, the music is pleasant, and the sound effects are about what you’d expect. Buy Tommy Lasorda Baseball on GameGavel or Amazon. Tagged Baseball, genesis, Review, sega, Sports, Tommy Lasorda Baseball. Bookmark the permalink.